My custom rocking chairs can be seen and used at a venue near you. 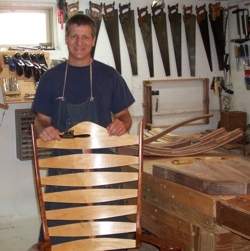 The custom rocking chairs I design and build come to life when experienced in person. People from around the country have said that seeing (and touching and using) really is believing when it comes to these wonderful chairs! Each one is hand tool made and has its own personality, just like its owner! Come by and try one out. Below are the events, times and locations where I will be displaying my beautiful rockers and other fine furniture. Updates will happen regularly so check back often. The Premiere craft show for the entire region! THE place where the highest quality artisans and craftsmen come together to display and sell our products.